The snow has started falling here at Bloomex headquarters, but there's no reason to be feeling cold with bouquets like this to warm you up. Our latest Product of the Week is the Here's To You bouquet. This arrangement is a lovely choice in any season, from the dog days of summer to the depths of winter. This particular bouquet features an assortment of uplifting Yellow Roses, modern Red Gerbera Daisies and Mini Carnations, and yellow Button Spray Chrysanthemums. 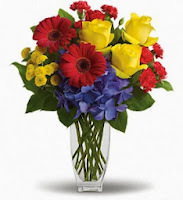 The Here's to You bouquet is a beautiful arrangement to send to a friend or loved one to bring their energy up, and its scheme of bright colours means it fits in nicely to virtually any room or spaceAnd with its low price and wide assortment of shades, it makes for an awesome value. Ideal for: Birthday flowers, bright-colour lovers, thinking of you. The Here's to You bouquet is a beautiful arrangement to send to a friend or loved one to bring their energy up, and its scheme of bright colours means it fits in nicely to virtually any room or space. And with its low price and wide assortment of shades, it makes for an awesome value.